This is my favourite one, and I know a lot of people disagree. Ever since I've lived as a grown up (as in, not a place with my folks), I've chosen voils over curtains. There's something so much better about waking up to the natural light and not feeling groggy, and unsure on what the time is (looking at you winter, when it's still dark at 8am!). We actually have venetian style blinds in our bedroom at the moment, which isn't to my taste, but as we're in rented we get by. I tend to pull the blinds down, but leave them open slightly, because we're on the ground floor so whilst it stops any nosy neighbours looking in as I undress for bed, it also still lets that natural light creep in as morning starts. I never understood this as a child, like, a mattress was just a mattress surely. WRONG. Actually, a good mattress, an incredible mattress infact is key, and makes such a difference. I'd had my previous mattress only four years, and I was pretty attached to it, so when I received a Simba Hybrid mattress I was sceptical. Sceptical as I'm not really a lover of the memory foam kind. And in all honestly, I wasn't sure after the first night, or even the third night. But we're now 5 weeks in and I LOVE IT. Genuinely. It makes me not only want to get into bed earlier (and even say I'm busy sometimes just so I can get more time in bed), but also doesn't leave me with aches and pains thanks to my awkward sleeping positions. So next time you need a new mattress, invest*. That's all I'll say - because it makes such a difference! As I mentioned, we decided against having a TV in the bedroom, which was a hard one to make (there were a lot of debates, and still debates going on now). And I think it helps. Because we tend to spend more time in the rest of the house (well, what there is! ), which then makes us associate our bed with sleeping, ensuring a better night sleep. Of course, I would be lying if I said I've never worked from my bed, because I know there's been a few very cold days and so working under the duvet (and on that comfortable mattress) is why I freelance, but where possible we keep it as a room for sleeping. Or unwinding. With a good book and a peppermint tea! This post is in collaboration with Simba, where I was kindly gifted a mattress, however all views and photographs are my own. 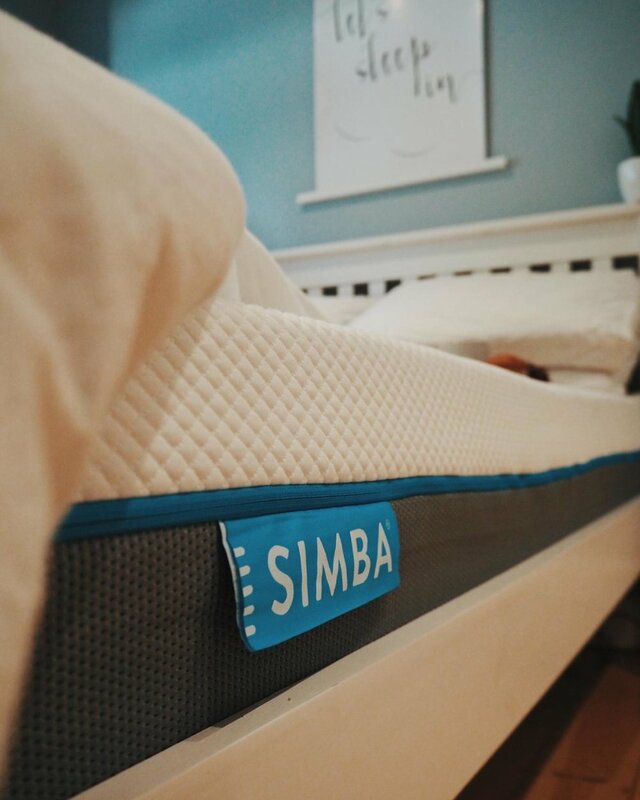 *If you click this link to Simba, it'll provide you with an amazing £75 off your own mattress, which definitely helps! And don't forget that they have their 100 night trial, which I think is a great sell. That's my honest opinion.